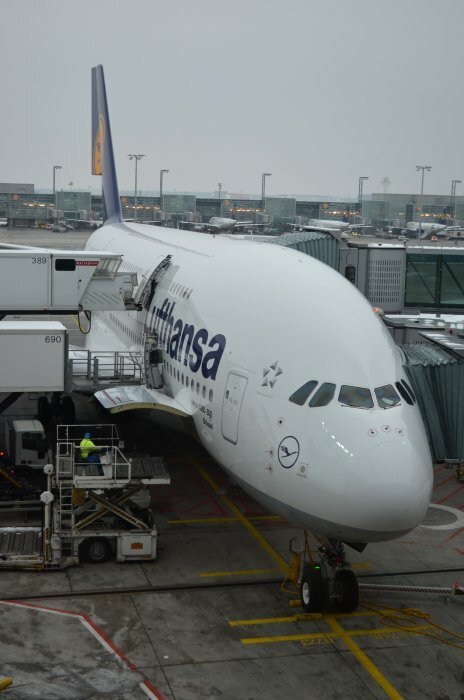 Surprisingly, given the number of A380s in service around the world (believed to be 98 at the time of writing), this was to be only my second experience of the giant Airbus 'super-jumbo'. As I approached Gate Z58 at Frankfurt Terminal 1, it quickly became apparent that six years after its maiden flight with Singapore Airlines, the aircraft was still capable of attracting a lot of attention, as numerous passengers walked up to the large windows to photograph the beast in which they would soon be spending the next ten hours of their lives. The allocated member of Lufthansa's flagship sub-fleet was D-AIMJ, named Brüssel. 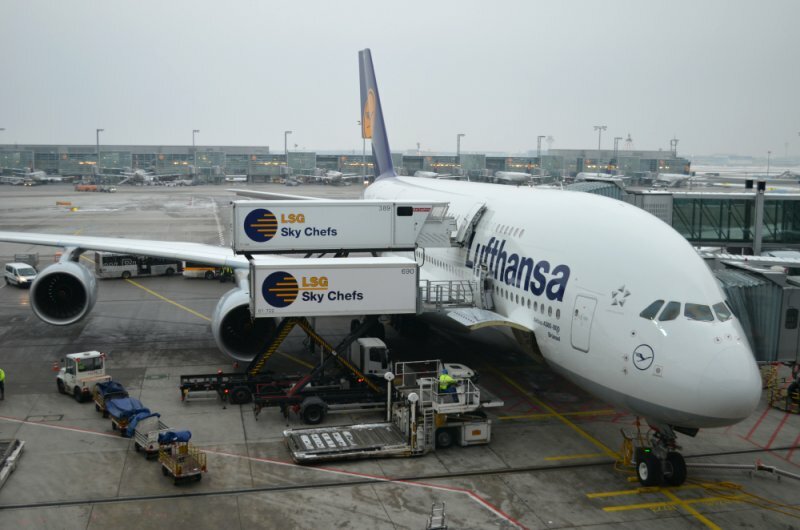 Even the simple act of boarding was a novelty with this leviathan: it was the first time I had ever entered the upper deck of an aircraft directly from the outside. 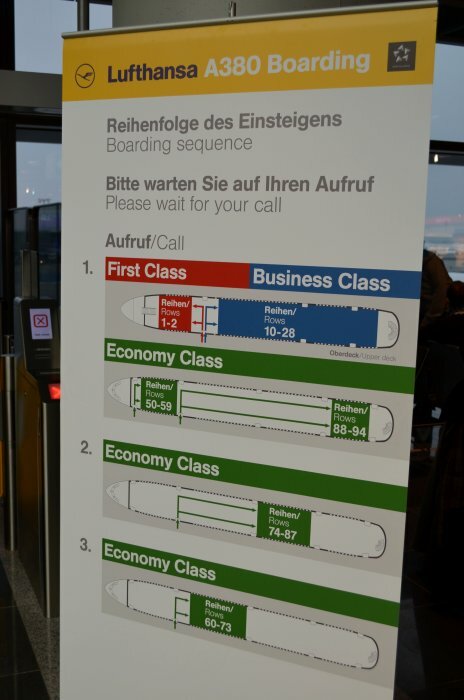 As I made my way back to my chosen seat (25K), it was good to see that my cabin section was relatively small, and was itself divided into a group of four rows, a gap for the doors and a final group of two rows. 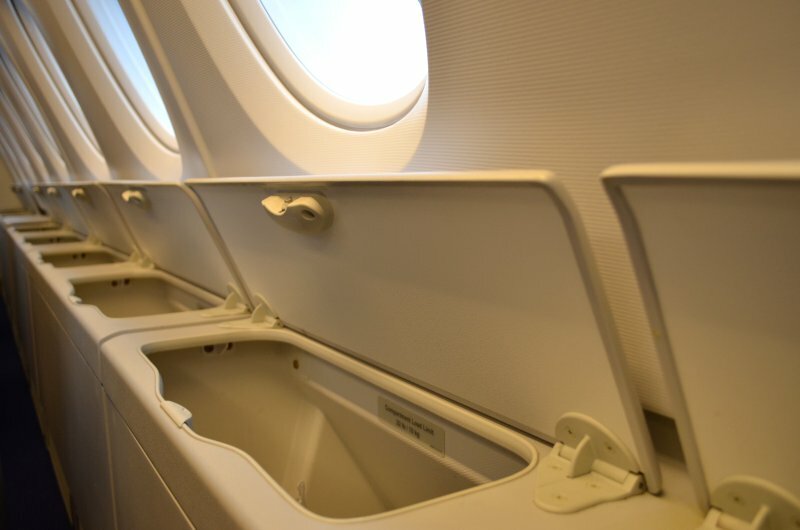 It was also pleasing to see the provision of some very handy storage compartments along the side walls, making use of space under the windows created by the curvature of the fuselage. 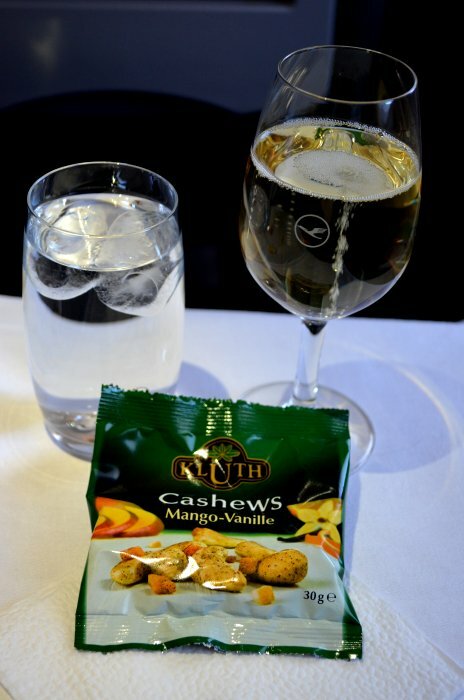 Precisely twenty minutes prior to the scheduled departure time (as is customary on Lufthansa), pre-departure drinks were offered, the choice being Sekt, water or orange juice. The expected flight time was announced as ten hours exactly and, part-way through the safety demonstration, we pushed back from our gate four minutes before 10am. 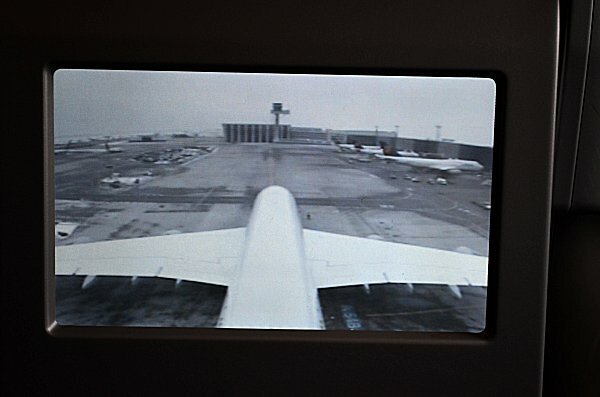 I was able to follow our taxi out to runway 07C on my IFE screen, a tail-mounted camera providing the pictures. 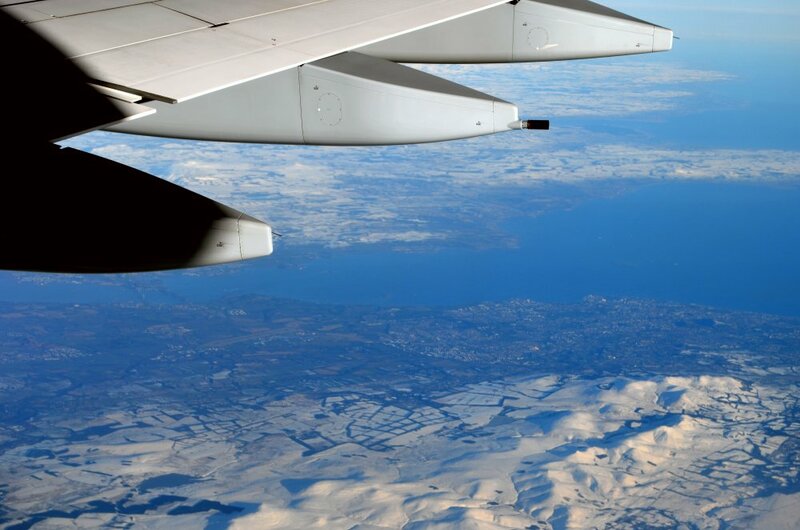 My second A380 take-off run once again proved to be amazing: the giant aircraft slowly coaxed itself into motion, quietly and unobtrusively gathered speed, and whispered its way into the cold winter air at 1015. 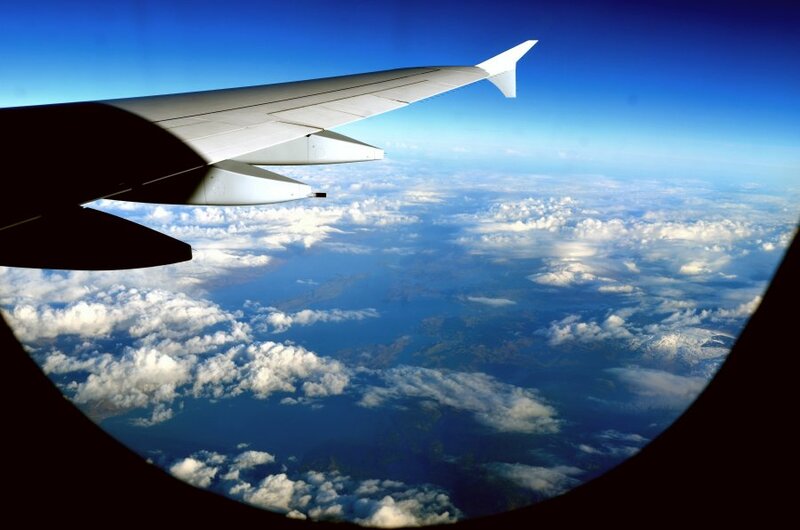 The relative lack of noise in the cabin was nothing short of astonishing. I set my watch back six hours. If you need more time to work or relax, we offer a cold Express Meal instead of the complete multi-course dinner: your choice of appetizer, cheese and dessert upon your request. I had a glass of champagne and some still water with ice when the drinks cart made its first pass. These were served with a packet of cashew nuts, flavoured with a most unusual combination of mango and vanilla; I wasn't at all sure that I approved of the innovation. 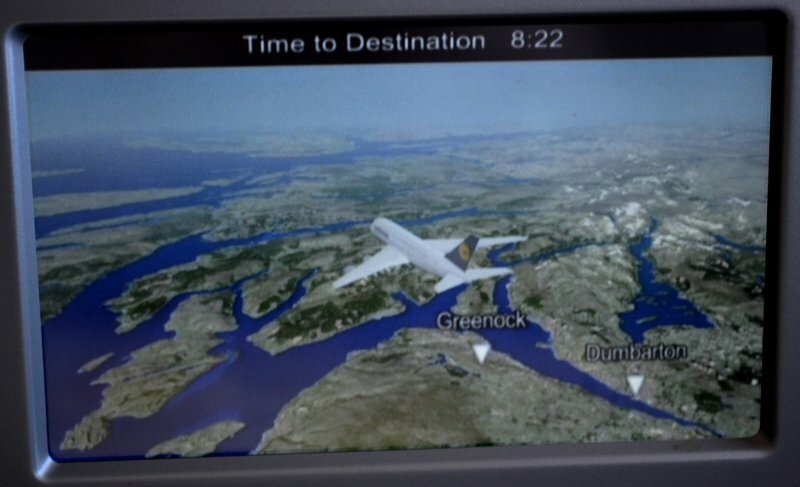 As I sipped my bubbly, it felt odd to hear the captain say: "We are currently over the North Sea and heading for Glasgow". We crossed the British coast near Newcastle and in the event passed to the south of first, Scotland's capital, and then the country's largest city. 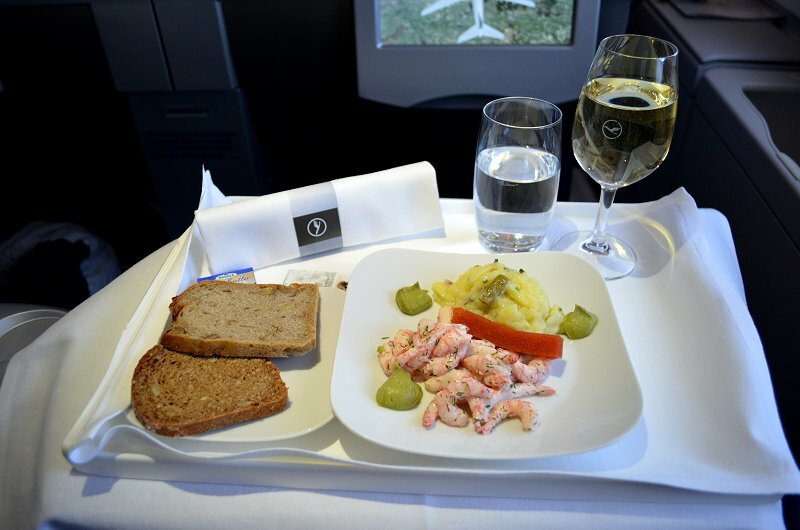 I enjoyed a starter of prawns and potato salad, accompanied by a couple of slices of German Schwarzbrot and a glass of the German white wine, as we completed our passage across my homeland. 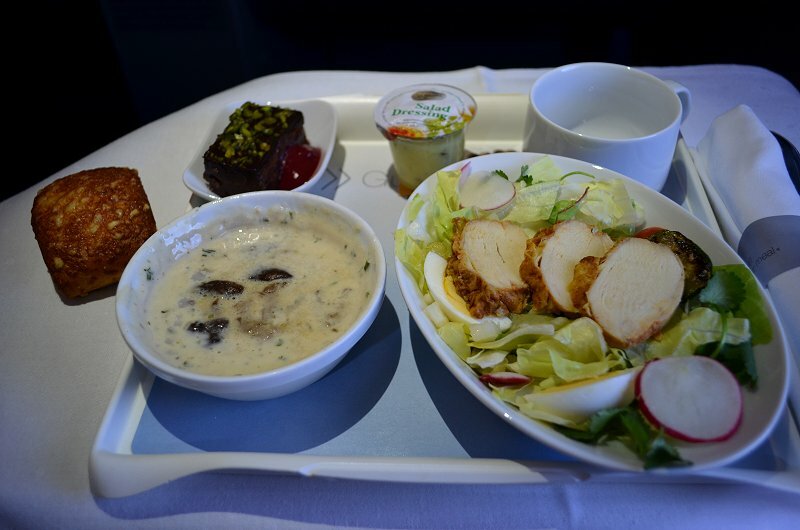 As we flew over the Western Isles, serving of the main courses was delayed due to severe turbulence. 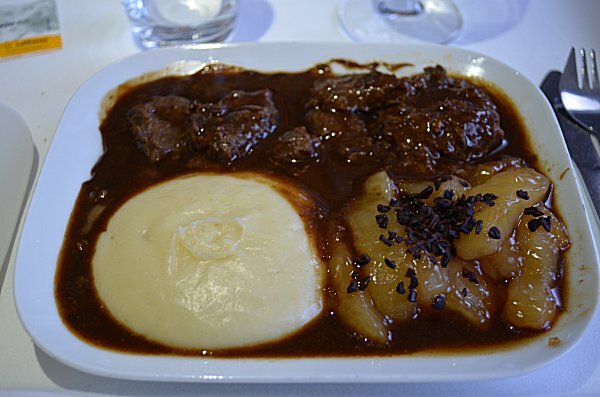 Once we got back to business as usual, I had a highly unusual main course of Belgian Goulash, featuring beer and chocolate - it was nicer than it sounds, especially when washed down with a glass of the Médoc! 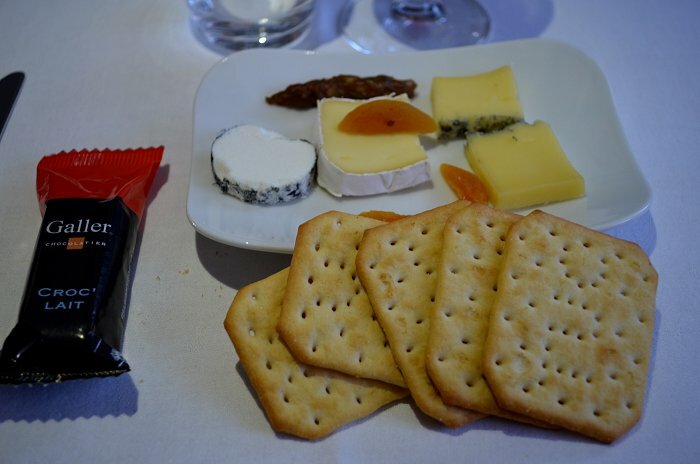 I finished off with the cheese course and a cup of coffee. 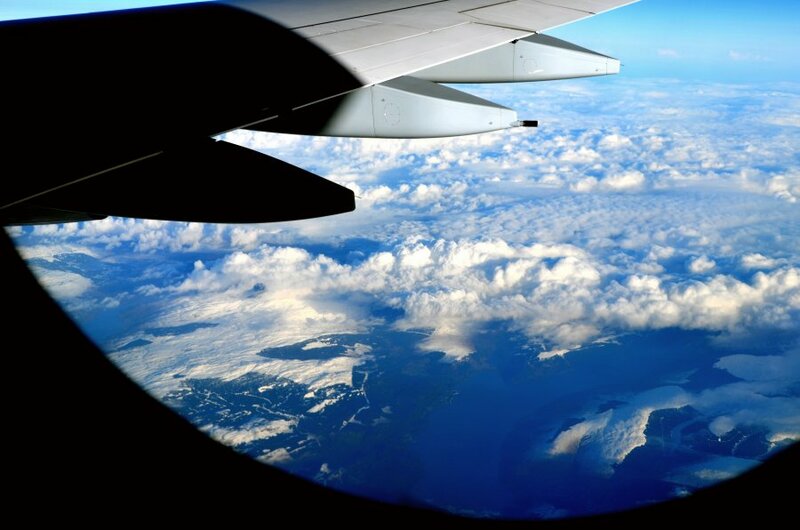 I watched two movies back-to-back, Enemy of the State and In Bruges, while our route took us well to the south of Iceland, barely clipping the coast of Greenland, and making our North American landfall over north-east Canada. (Is it just me, incidentally, or did this flight have a strong Belgian theme running through it?) I was kept well supplied with fruit juice during this time. With two films under my belt, I then decided to read for a while. With two hours left to run, a further round of hot towels signalled the start of the second meal service. 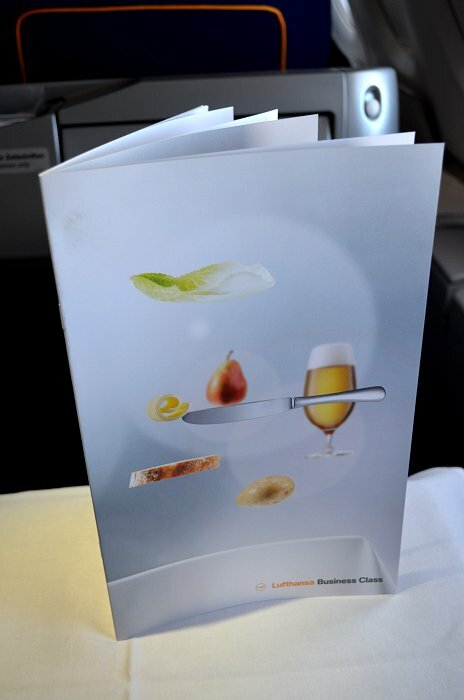 In accordance with the Lufthansa Hot Towel Conundrum that I have pondered over many a time, these were - as ever - the good ones, while the first round had used the basic variety. It seemed only right that I should enjoy a performance of Dvořák's Symphony No 9 in E minor (subtitled From the New World) as I enjoyed the light second meal along with some apple juice and coffee. We left the coast near Wilmington, North Carolina and flew past Charleston and Savannah - both upcoming destinations for yours truly! 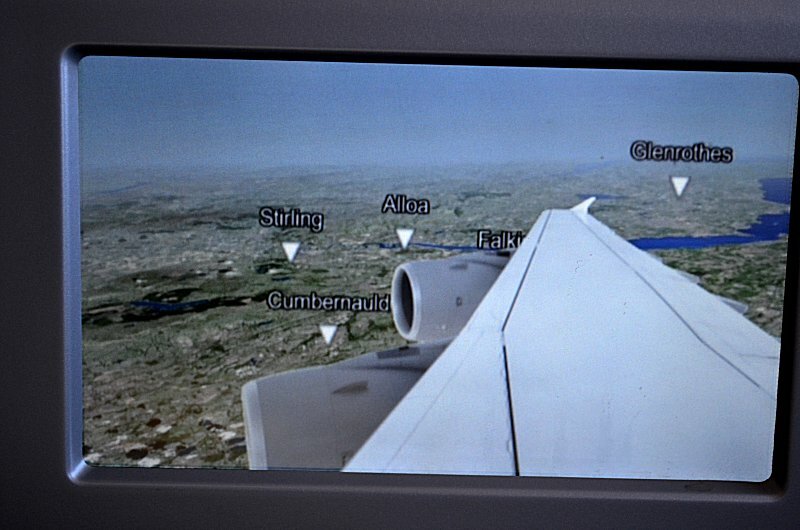 Eventually we turned back inland across Miami and executed a U-turn to make an easterly landing at the airport. I was able to watch the tail camera's view of the final approach. 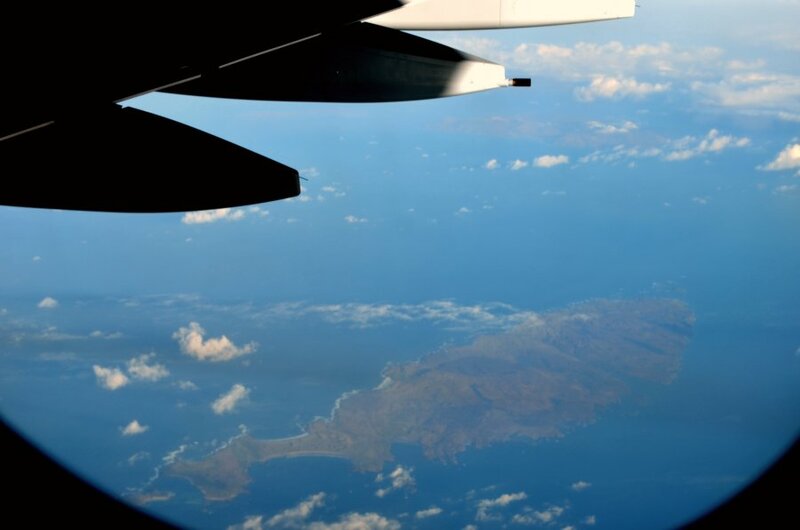 We touched down at 1412 local time and after a remarkably short taxi, were parked at the gate within a mere three minutes. 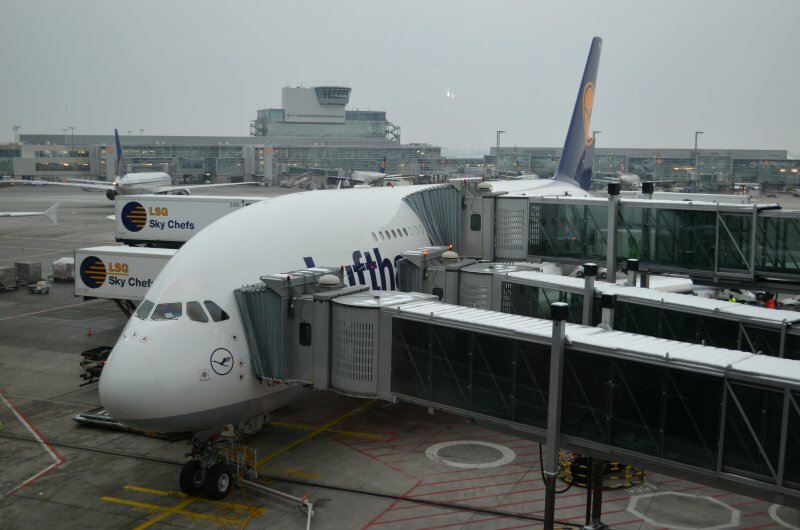 Overall, I once again realised that I love travelling in the awe-inspiring A380 - even when it isn't in Singapore Suites and even when it isn't Lufthansa's latest Business Class product, as featured in the new Boeing 747-8s.